Here is Some information about Ekambareswarar Temple in Kanchipuram Tamil Nadu India. Location: Located in kanchipuram in tamil Nadu State. 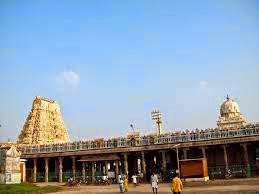 Temple Timing: 6.00 to 11.00 a.m. and 5.00 to 8.00 p.m.
Ekambaranathar temple is the famous temple which is situated in this holy town of Kancheepuram, one of the Panch Bootha Sthalangal of God Shiva. 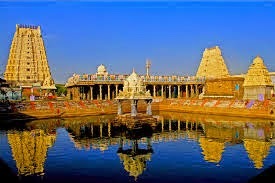 Well known as the "City of Temples", Kancheepuram which is one of the seven great holy centers of ancient India. It was a royal capital once, a flourishing Buddhist and Jain center mentioned in the Tamil Epic Manimekalai, it was being intimately associated with Pallava and Chola Kings and was connected with the lives of saints. During the Chola period it was a seat of art, religion, education and trade. 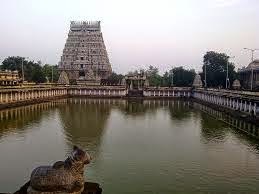 The Chola kings built several temples in and around Kancheepuram, also known as Kanchi. The temple covers an area of over 40 acres. 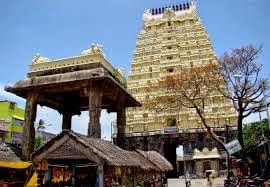 Reaching a height of 57 meters, the temple’s Raja gopuram (the entrance tower to the temple) is one of the tallest in South India and was built by the Vijayanagar King, Krishnadevaraya. 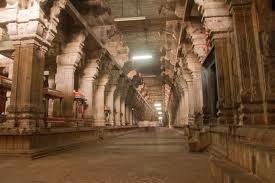 One notable feature of the temple is the Aayiram Kaal Mandapam, or the “hallway with a thousand pillars”, which was built by the Vijayanagar Kings. The temple’s inner walls are decorated with an array of 1,008 Siva lingams. According to history goddess parvathi closed lord shiva eyes for fun. At the time of lord shiva’s eyes were closed the universe became dark because sun and moon are the two eyes of Shiva and life of all creatures became stagnant. Immediately, Lord Shiva opened his third eye hence saved the universe. MaaParvathi felt sorry about what she did. Then Shiva said to penance to washout the mistake. 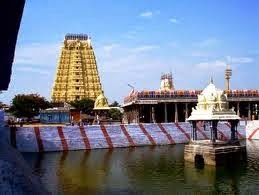 Then GodessParvathi born on earth with name Katyayani and started penance at kanchipuram (also known as Kanchi). Later on Shiva wants to test Katyayani (Parvathi) and sent Ganga as flood. At the time Katyayani worshipping sand shivalinga and scared that the linga may flood, Immidiately she hugged the linga to protect it. At the time of hug the linga got marked by her bangles and Kuchas. Even still you can see the marks on the shivaliga at Ekambareswarar temple. Shiva pleased with her devotion and married goddess Parvathi. Still we can see the Kalyana idols under the mango tree in the temple.